Be the first to share your favorite memory, photo or story of Deacon Jessie. This memorial page is dedicated for family, friends and future generations to celebrate the life of their loved one. Jessie Jones was born August 10, 1939 in Snow Hill, North Carolina to Casey Jones and Hannah Lewis. He was the eldest of seven children. He departed this life on Wednesday, March 6, 2019 at Clara Maass Medical Center in Belleville, NJ. During his childhood, he attended the Greene County public school system in Snow Hill, North Carolina. Jessie met and married Ella Mae Bryant while in North Carolina. He then became the father of three sons, Roger, David and Troy. Roger preceded him in death. He relocated to New Jersey to give his family a better life. Deacon Jessie Jones became a tractor trailer driver. He worked in the meat industry for many years and was employed by Shoprite Supermarkets Inc. (Wakefern Corporation). Deacon Jones joined Union Gospel Tabernacle in 1989. He was a hard worker, faithful to the church and always willing to lend a hand. He was a member of the Deacon Board, Bible Church School, Men’s Chorus, Men’s Club, Usher Board, and even volunteered to drive the church van on many occasions. He was always willing to help and never said “NO”. 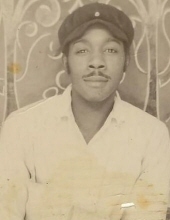 Deacon Jones leaves to cherish his memories: his wife of 58 years, Ella Mae; two sons, David and Troy Jones of Newark, NJ; 3 grandchildren, Kayla, Travon and Joshua; one brother, William Henry (Cynthia); two sisters, Mary Lee of Newark and Mildred of Snow Hill, NC; 7 sisters-in-law and 5 brothers-in-law; a godson, Garod Lambert; and a host of nephews, nieces, relatives, loving friends and his church family. Deacon Jones was preceded in death by three of his siblings. This Online Memorial has been created to commemorate the life of Deacon Jessie Jones. Leave a message on the Tribute Wall to share your favorite memories and offer words of sympathy and comfort. To send flowers or a remembrance gift to the family of Deacon Jessie Jones, please visit our Tribute Store. 756 Dr. Martin Luther King Blvd. "Email Address" would like to share the life celebration of Deacon Jessie Jones. Click on the "link" to go to share a favorite memory or leave a condolence message for the family.